Imagine, for a moment, that you're the proprietor of a charming bed-and-breakfast on a small barrier island. A few people live in the nearby village year-round, and some of them regularly come to dine at your establishment, but your livelihood chiefly depends upon the seasonal tourist trade. The only way on or off the island is via an aging, two-lane bridge. It's how tourists reach you, how you cross to the mainland to purchase supplies, and how deliveries get to you from mainland-based vendors. That bridge is your lifeline and your lifeblood. But there's a problem. One day, folks in your village awake to find that a section of the bridge has deteriorated. It's still navigable, but the clock is ticking. A debate ensues about how best to address the issue. The village divides into two camps. A forward-thinking group of business owners and citizens advocates for the village to conduct an environmental impact study, solicit bids from engineering firms, pass a new levy and divert resources from other projects — beach maintenance, the annual summer festival and repaving the wealthiest neighborhoods for the sixth time in four years — to fund construction of a sleek, functional, modern, 4-lane bridge, designed to last for the next 50 to 75 years. The other group — more budget-conscious and narrowly focused on their own profits or tax bills — argues that the old bridge will be just fine. They want to pay for cheap, quick patchwork repairs and carry on. Now, as someone who uses (and whose customers use) that bridge virtually every day, which solution would you trust more not to suffer a critical failure? Which one would serve your business more in the long run? 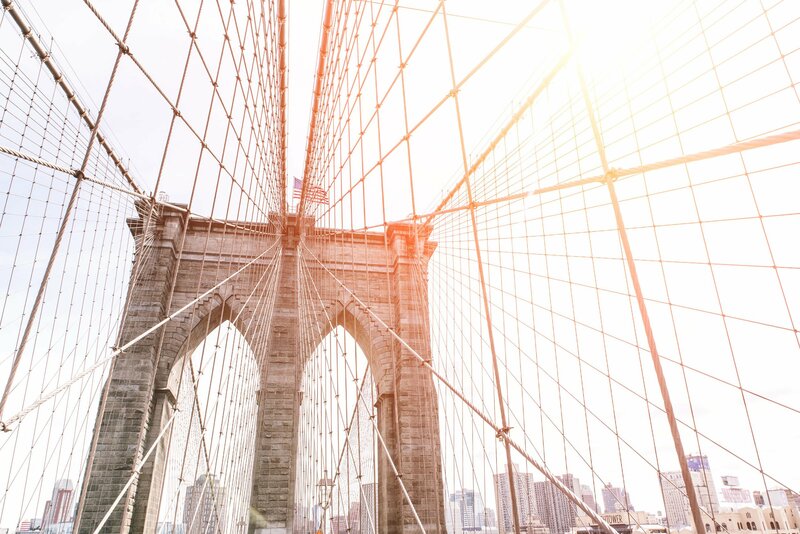 Your marketing strategy is your business's bridge. It's how you connect with your customers. It's how you carry your message to them and, in turn (if you're investing appropriately in data collection and analysis), it's how they communicate their preferences to you. Your channels — social, paid search, SEO and inbound, videos, radio, TV, print, billboards, paid media and advertorials, podcasts, etc. — are all the girders, plates and rivets that comprise your bridge. Should a channel underperform or fail, the entire structure is the weaker for it. Too often CMOs, whether under pressure from their CEO or board members to stick to a bare bones budget, or harried by time constraints and understaffing, or through a genuine belief that integrated marketing isn’t critical, resort to plugging holes. Squeakr is the hot, new social channel all the college kids are flocking to, we need to redeploy all our engagement resources there for the next 6 months. Our visual branding looks dated. Let's put off the e-commerce web redesign until this quarter next year. Agencie Chanteuse had some lovely ideas for refreshing our logo and style guide. They say customers today really respond to custom fonts. We're only ranked #3 in Boingle searches. Quick, cancel that video production, lay off the social media manager and put our budget into SEO. It can be difficult not to respond with knee-jerk reactions like these, but they rarely ever yield long-term success. At Cleriti, we understand that marketing is complicated. In today's data-driven, analytics-dependent, breakneck business cycle, you can't afford to run yourself ragged patching holes. If your marketing bridge has flaws — no matter how small or trivial they seem — it's weak. The longer you try to repair it piecemeal, the more likely it's all going to come crashing down on you and cut you off from your audience. And, if it does, guess what? The new mega-resort next island over is going to take your customers away for good. A CMO or mid-level marketing manager's first responsibility isn't just to grow the brand — it's to protect the brand. It’s when your brand is secure — when your marketing bridge is rock-solid and smoothly, efficiently accommodating all the traffic flowing over it day after day — that you’re able to successfully move forward. If some of your channels are turning into consumer engagement potholes, don't just do a crude patch job. If your marketing strategy feels wobbly, don't waste money, time and energy trying to temporarily shore it up. These kinds of efforts can hinder your growth. We'll help you build a better marketing bridge. Think of us as your experienced, dynamic architectural firm — one that can help you focus on the most feasible long-term solution. We'll help you design a marketing strategy that'll bring not only today's customers to your brand, but tomorrow's customers, too. And customers the day after that, on into the foreseeable future. Because we're constantly pouring over consumer data. We obsess over best marketing practices: what they are, how they're changing, what they'll likely become. And we're always looking toward your company's future. First, we'll pair you with our insightful strategy engineers, who will listen to your marketing needs and wants, help you parse through your consumer data, and mine out shrewd, actionable business intelligence. Then, we'll collaborate with you to design an efficient (and sound) marketing strategy within your means. Going forward, we'll support your ongoing marketing needs through considered, data-driven planning. We'll produce high-quality, relevant and resonant content that aligns perfectly with your integrated strategy. We'll help you converse with your consumer segments in the languages that each of you understands, on the channels you mutually inhabit. And, when we see opportunities to amplify your voice or expand your reach, we'll point them out and help you develop them. Are you ready to build a better bridge to your customers?